New Human Touch Replacement Pad Sets for your Perfect Chair. 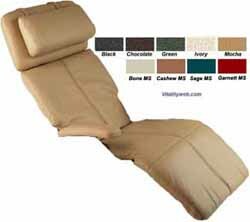 - These pad sets work with Genuine Human Touch Perfect Chairs with the Armrest Caps. Some older PC-P2B, PC-7, PC-9 and others may need to add the Optional Armrest Blocks below to work. 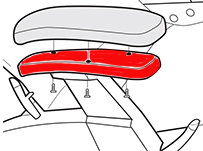 New model Perfect Chairs will have armrest caps as pictured in the Diagram below. The caps can be removed with three small philips screws (2-front and 1-back). The screws are hidden in the bottom of the armrest (look for small screw holes in the vinyl under the armrest). 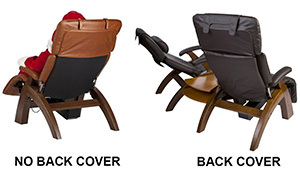 There are several Material Options on the Human Touch Perfect Chair Recliners. What is SofHyde? SofHyde is a luxurious and durable upholstery expertly formulated to replicate the comfort, style and "feel" of real leather. SofHyde is designed to last for many years of use and is comfortable, soft to the touch and stain-resistant. What is Top-Grain Leather? Surrounding yourself in fine leather is the ultimate luxury. Our top-grain, aniline-dyed leather is made from the strongest and most supple part of the hide. Perfect Chairs are made in a variety of different leather colors, finishes and matches, including some rare and hard-to-find vegetable-tanned and glass-polished limited edition selections. No matter which one you choose, the leather’s texture is soft to the touch and its hues are rich and inviting. When seated in the chair, you will feel cradled in comfort. What is Premium Leather? Only five percent of the world’s natural, uncorrected cowhides are sufficiently free of imperfections to qualify for use as Human Touch Premium Leather. Top-grain, aniline-dyed hides from the United States and Brazil are carefully measured, cut and sewn all under one roof. This is what makes the supple leather luxurious, resilient and so soft to the touch. See PC-410 / PC-510 Pad Sets below for more color options. - USA UPS Ground Shipping Included! - Will fit most older PC-075 Silhouette Perfect Chairs as well. - Will not fit other Perfect Chairs. 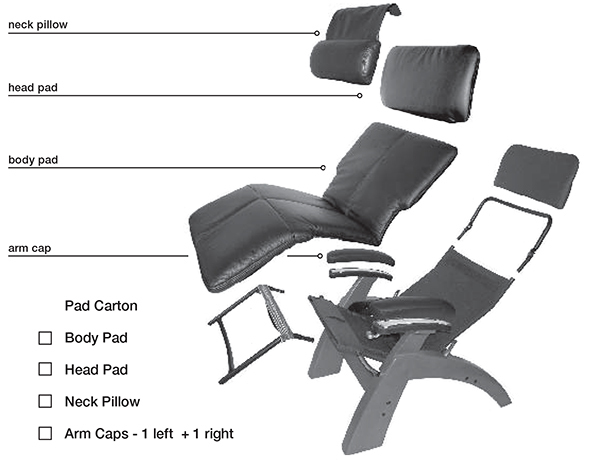 - PC Live Pad Set includes Memory Foam, Jade Heat and Seat Gel Cushion Installed. Covers the back mesh material on the rear of the chair. Good for chairs that are seen from the back. - Available in a 250ml, 100ml or wipe kit. New and Factory Refurbished Perfect Chairs are now available.